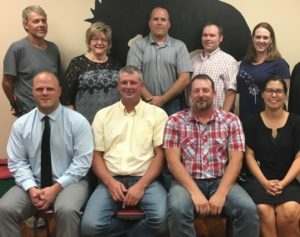 Members of the Colome Consolidated School Board earned statewide recognition for their dedicated participation in activities, board development and training and demonstrated leadership at various areas and levels. The Colome Consolidated School Board earned a gold level award for their participation in the Associated School Boards of South Dakota board recognition program: ALL, which stands for Act, Learn Lead and honors the work of school boards striving to enhance their knowledge base of board work. By participating in ASBSD activities, training opportunities and demonstrating leadership at their local, state and national level, school boards accumulated points throughout 2017-18 school year to achieve an award level. To earn the Gold level award, Colome Consolidated School Board accumulated 500 or more ALL points. On Oct. 8, a representative of the ASBSD honored the Colome Consolidated School Board with the presentation of their ALL plaque. In the second year of the program, more than one third of the total number of public school boards in South Dakota earned ALL award through a variety of training, development and leadership opportunities. “The Colome Consolidated School Board and boards across South Dakota are devoted to enhancing public education in this state,” said Pogany.